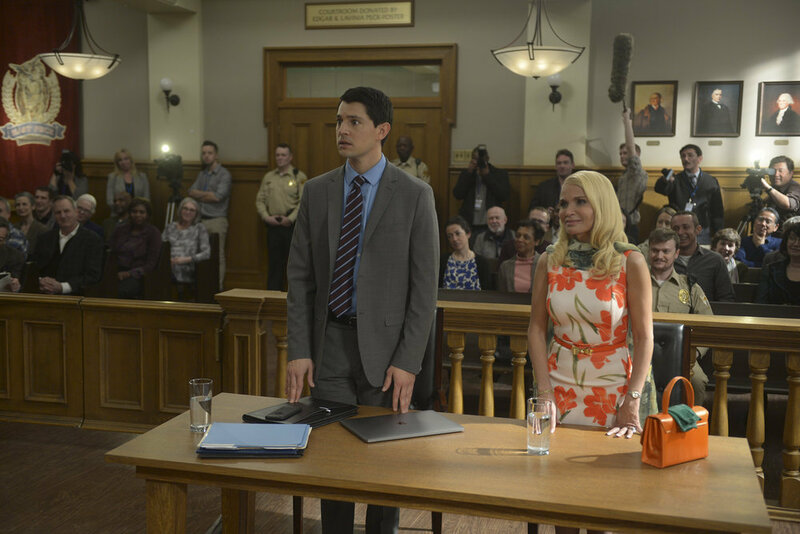 Of course, it’s not just the actor/actress playing the alleged murderer who shines in this show; Trial & Error has always been about the ensemble of characters, and Lady, Killer lets our main characters – Josh, Dwayne, Anne, and prosecutor Carol-Anne – shine just as brightly as Chenoweth’s Lavinia. Josh Segal (Nicholas D’Agostoa) has recently purchased a home in East Peck and moved in full time. He wants nothing more than to be accepted as an East Pecker (instead of always being known as an outsider) and he’s hoping that successfully defending the most popular woman in town will be the thing that brings him that recognition. Dwayne Reed (Stephen Boyer) has been reinstated as a member of the East Peck police department and splits his time between working for them and working for Josh’s legal firm (Josh Segal & Associates) which leads to some interesting tension in later episodes as Dwayne’s loyalty is split between his friend, Josh, and the town’s police department (which Jayma Mays’ Carol-Anne Keaton quasi-leads as the prosecutor of Lavinia’s case). Anne Flatch (Sherri Shepherd) sort of gets the short end of the stick in terms of character development/plot arc as she isn’t given much different to do when compared to last season, but she’s still a joy to witness and her ever-growing list of maladies that she’s inflicted by continues to delight. Carol Anne-Keaton (Jayma Mays) starts off the season heavily pregnant with someone’s baby. She’s narrowed it down to something like six people, but Josh is pretty sure it’s his (and the show seems to imply that, as well). Naturally, she’s still running for District Attorney and continues trying to prove her worth as a female prosecutor in a town that really doesn’t value women very much (as a number of funny jokes go on to prove). The tension between Carol-Anne and Josh continues to simmer as they flirt and bicker and go at each other’s throats throughout the episodes. Fans of the first season will notice one name that’s glaringly missing from the cast list (aside from the obvious John Lithgow who has no reason to return in the context of the story): Krysta Rodriguez as Summer Henderson. While she was Larry’s daughter, it was implied that she’d be sticking around as a member of Josh’s new legal firm in the town. She does not. There’s no real mention of her (or her dad), and we’re left to assume that the two of them are off doing something lovely together or something. In her place is Nina Rudolph (Amanda Payton), host of the Serial-esque podcast “M-Town” (“Murder Town”). She is in East Peck covering the trial of Lavinia Peck-Foster for the second season of her podcast. Nina is a pretty good character and Amanda Payton plays her well, but I can’t help feeling like she’s just a replacement for Krysta Rodriguez’s Summer. The two characters fulfill the same narrative purpose and both of them also end up being love interests for Josh. I like the idea of her being a podcast host and reporting on the trial (and taking tons of comments out of context and sensationalizing everything even further), but the show doesn’t really do much with that. There’s a lot about that genre of podcasting that could be satirized, much the same as the true-crime genre of TV is satirized in both seasons, but they just take the easy joke with it. I’m hopeful that over future episodes, they’ll do more with that element of the character and elevate her from being just a love interest for Josh/stand-in for Summer. Along the same line, we have a new judge presiding over the murder trial this year. Gone is Patricia Belcher as Judge Horsedich, in is Joel McCrary as Judge Kamiltow. Naturally, every character in this show has some kind of weird quirk and the judges aren’t exempt from this rule. Horsedich’s quirk was mainly that her name wasn’t remotely pronounced the way you’d think it would be. At first, it seems they’re gonna go that route with Judge Kamiltow as well, but then it turns out that, no, his name is actually pronounced the way it looks, but instead he isn’t able to speak at a volume louder than a squeak. As the first episode finished, I thought to myself how old that joke was gonna get and, unfortunately, it definitely gets real old real quick and never really gets any better. We’re told why he can only speak like that in a later episode, but it doesn’t really make the joke any funnier and it kinda just drags the scenes in the courtroom down as we can’t understand what he’s saying (neither can Josh, which is the joke) and they don’t bother subtitling him, so it’s just a bunch of squeaks and it’s funny the first time and quickly gets less funny every subsequent time. 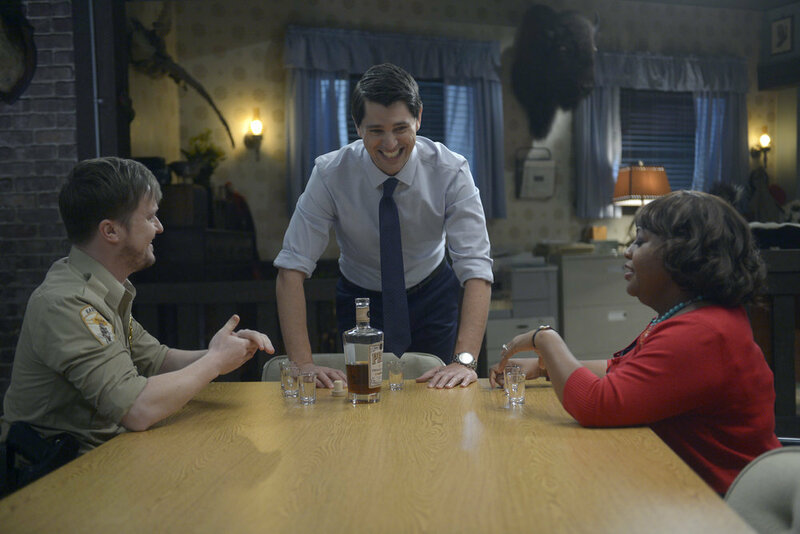 Like the first season, Trial & Error: Lady, Killer is not without its flaws. Some of the jokes don’t land as well as the writers hoped (looking at everything involving Judge Kamiltow) and some characters aren’t explored to their fullest and feel like stand-ins for other characters, but on the whole, the show remains just as funny and enjoyable as the first season. Every episode ends with a delightful plot twist that leaves you hanging and craving the next episode. The actors are all delightful, especially our main four and Kristen Chenoweth. The mystery is really interesting too, and the writers don’t fall into the trap of having it play out exactly like the mystery last season played out. There are similarities, sure, but there are enough differences that it still feels fresh, and Kristen Chenoweth goes a long way to selling Lavinia as a potential murder. The thing I most like about her performance is that, after half the season, I really can’t tell if she did it or not. With Lithgow, it always felt like he was innocent and just said the wrong things at the wrong time. Chenoweth really feels like she could be guilty, and that adds a nice element to the show. On the whole, Trial & Error: Lady, Killer is a worthy successor to the first season and continues the story in an enjoyable way. 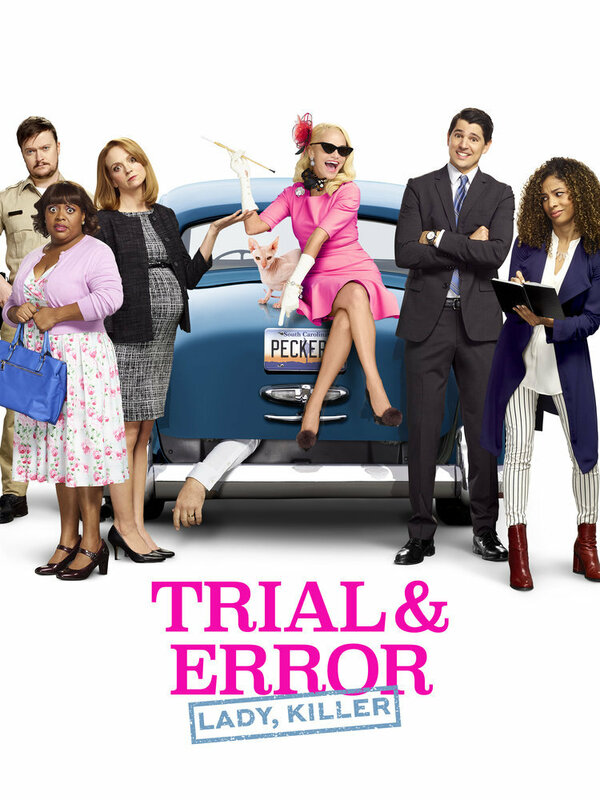 Filled with excellent characters, actors, and humor, there are worse ways to spend an evening than watching Trial & Error. Episodes 201 and 202: 4 out of 5 wands.